I first heard about Float Therapy on one of my favorite podcasts, it has been on my radar for quite a while. With our March theme being New Things, I decided to live our theme in practice and booked my appointment at Float Boston. 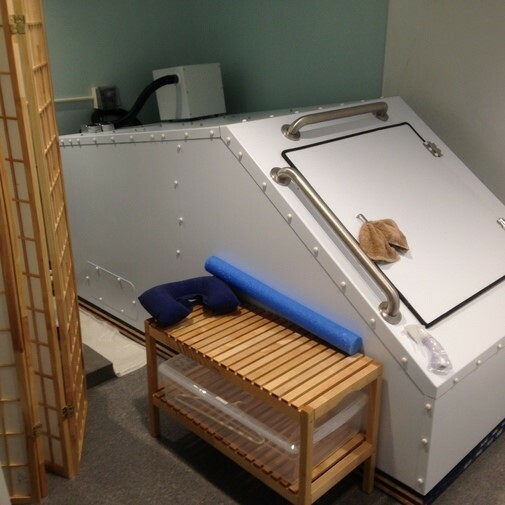 Flotation therapy is essentially floating in warm salt water in a large tank. Think about taking an Epsom salt bath to soothe your joints, but in this case the tank is filled with hundreds of pounds of salt making floating completely effortless. The tank is both sound and lightproof allowing you to completely disconnect from the world. A session lasts anywhere between one and three hours. Flotation therapy is believed to improve a number of ailments including stress and anxiety, joint and muscle pain, back pain, high blood pressure, and insomnia. I wasn’t sure what or how much relief to expect from my float, but I figured that even an hour’s break from pain and anxiety is worth trying. When I arrived for my floating session, I was greeted by Sara, one of the owners of Float Boston. Sara gave me an overview of the protocol for before and after my float including showering and after care. This part was really important in making my float a positive experience – why? She instructed me on how to move my arms and legs to find the most comfortable floating position. Perhaps the best advice she gave me was to use a washcloth to prop open the hatch if I wasn’t ready for total darkness. Finally it was time: I took a shower, applied petroleum jelly to protect a few scrapes I had, and opened the hatch of the tank. I’m not going to lie – the moment you open the tank to climb in is a little bit overwhelming. Most people worry about feeling claustrophobic, but as I climbed in I was surprised by the length of the tank (about 7 feet). In those first few minutes I would have preferred something smaller, more womb-like. I climbed in and kneeled down in order to reach the hatch and close it. As the light from the room’s soft, salt lamp diminished I became aware of my own fear – not of the space, but of the dark! Under Sara’s suggestion, I used a wash cloth to keep the door propped open allowing a small sliver of light to enter the tank. Being able to look up at the light and orientate myself with the hatch was immensely comforting. From kneeling to close the hatch, I moved into a seated position before slowly leaning back into the water to begin my float. The floating part is effortless, but it took me awhile to find the most comfortable position. This ended up being legs extended with my arms clasped on my chest. Once I found my comfy spot I closed my eyes and just let go. As time passed, I could feel my body relaxing and lengthening more and more. Every time I felt as though I achieved my most relaxed state, I could feel my body “sinking” (hah!) further into the float. At one point I nearly nodded off and startled awake. That startled feeling passed almost instantly, and I got right back to that deep relaxation. The most amazing part of my float was feeling almost disconnected from my lower body. I found myself subconsciously wiggling my toes periodically almost as if to ensure they were still attached. In my incredibly relaxed state, this didn’t feel scary. More of just a “hey, toes just checking on you”. I carry A LOT of pain from lower back to my hips and knees, and the sensation of being disconnected from all of that, to feel no pain in these areas, was incredible! The most challenging part of my float was shutting my brain off. Some people achieve deep states of meditation while floating, but unless you are quite advanced in your meditation practice, don’t expect this to happen your first time. Instead I focused on my yoga breathing – the simple act of drawing my breath in and filling my chest and exhaling as deeply as possible. Focusing on only my breath helped to distract me from thinking about other things. While I never fell all the way asleep, I felt like I sort of drifted in and out of a light nap. When my float was over, music played softly in the tank increasing gradually in volume gently rousing me back to reality. I sat upright taking a few moments before kneeling and slowly raising myself out of the tank. My legs felt a little bit rubbery and it took me a few moments before I could stand to shower again. After I showered and dressed, I took advantage of sitting in the relaxation room for almost a half hour before making my trek home. Float Boston keeps their relaxation room stocked with water, tea, magazines and even mandala coloring books! For the rest of the evening I felt, for lack of a better word, light. I felt like my spine was elongated, that I was standing taller and my relaxed muscles remained nearly pain free for the rest of the evening. Better yet, I got some of the best sleep of my life that night! All in all, I loved my float experience and the relaxation (mentally and physically) that I was able to achieve. The only drawback was that knowing that I had to write about it kept my mind engaged – making note of different things I wanted to remember. I’ll definitely go back to Sara and Float Boston in the future, and next time I’ll ditch the wash cloth and explore the darkness! Interested in Float Therapy? Do a search for “float therapy” and your location to find one near you. Float Therapy sessions cost approximately $60/hour. Many places offer memberships in which a monthly fee reduces the overall price per session. You can read more about Anna’s story on her blog http://sixhipsandcounting.com/, and you can also follow her on Twitter, Instagram and Facebook. Can Massage Help RA Pain?